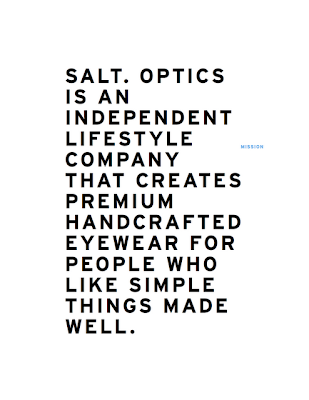 Fall Preview: SALT Optics. In stock now. SALT. Optics 2011 from SALT. Optics on Vimeo. But seriously, (and when it comes to this blog I'm always serious. Or something. Maybe seriously annoying but why quibble?) it's just a matter of weeks until back to school, football and cooler temperatures. Of course this means that we are starting to see new cool arrivals already making their way into the shop... kind of like how Christmas decorations show up in stores before Halloween is even over...I'll try and keep up with all the stuff we get, but it's going to be a lot. I have a problem...I like beautiful product and I buy a ton of it. Look for me on a future episode of the show "Hoarders" sometime in the future.